The frozen peaks of the Freljord have for centuries punished the weak. But as these feared glacial lands host the graves of the frail, for the mighty, the land is a cradle, a place that elevates mere strongmen into true champions. Braum’s story started here, and as his strength and fortitude grew, so too did his legend. Today, his feats inspire all from the poorest of peasants to the fiercest of raiders. And as he prepares to bear his shield into battle once again, he goes knowing he carries the hopes and adoration of the Freljord’s people with him. Braum’s basic attacks apply Concussive Blows. Once the first stack is applied, all basic attacks from Braum and his allies apply further stacks. Targets that sustain four stacks are stunned and suffer bonus magic damage. After being stunned, Braum cannot apply Concussive Blows to his target again for a moderate duration. Concussive Blows is certainly a deadly passive in close combat and it’s quite overpowered in comparison with most passives in game. But taking in consideration that Braum is a melee character and he won’t be able to frequently hit enemy champions during the lane phase, then it might mean that this passive is not as strong as it first appears to be. However, I think it will be very devastating, specially when used with disable skills. That way hitting enemy champions and stacking Concussive Blow stacks will be much easier, thus triggering almost permanent stuns. Note that basic attacks from allies also grant stacks. I’m not sure how long this stun will last but it will certainly be a very short one, probably around half a second. But despite the stun duration, I think this passive will most likely need a small power reduction upon release because having free stuns and bonus magic damage every four hits is a bit too much in my opinion. Braum propels freezing ice from his shield in a straight line skillshot, dealing magic damage (based on Braum’s max health), slowing and applying a stack of Concussive Blows to the first target hit. 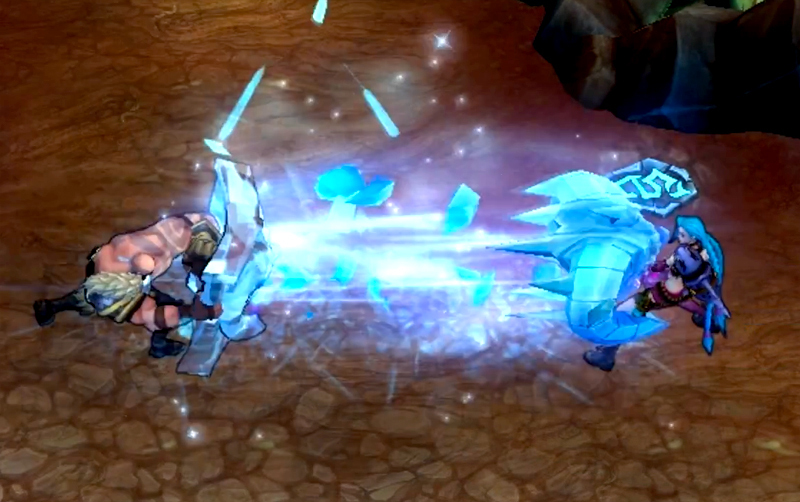 Braum will use his frozen powers to slow enemies in a straight line. Nothing special there, it’s completely normal for support champions to have some kind of disable abilities. However, in Braum’s case this skill will enable a combo with his passive. 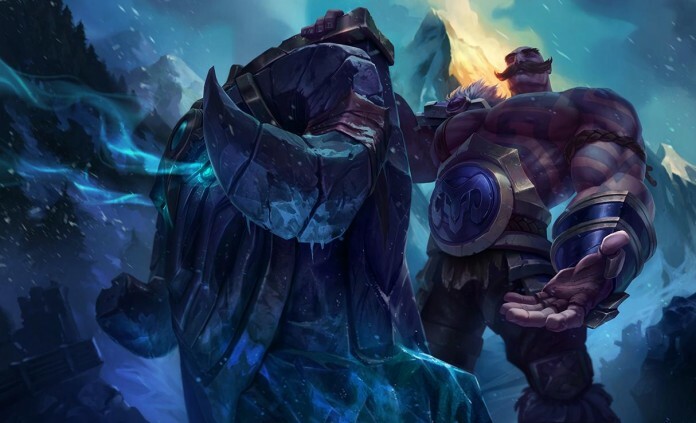 By using Winter’s Bite, he’ll automatically apply a Concussive Blow stack, therefore the allied ADC just needs to hit the same target and it will trigger a stun upon three more basic attacks. 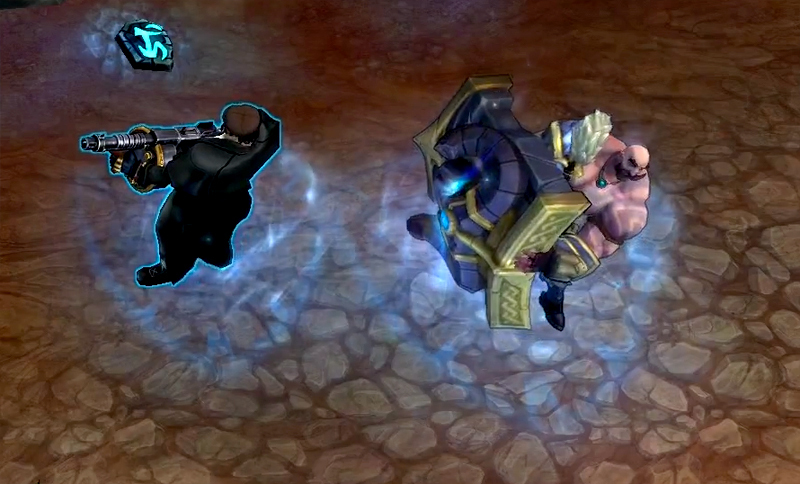 Also, as the target is slowed, Braum can possibly hit the enemy himself, triggering the stun even faster. This skill will surely be a precious combat gem, since it has an offensive and defensive role. The most obvious usage is to engage and slow enemy champions, however it can be also used to prevent enemies from flanking you and your allies. Braum leaps to the aid of a nearby ally, positioning himself between his target and their nearest enemy champion, and granting both Braum and his target bonus armor and magic resist based on his total armor and magic resist. Stand Behind Me is a notorious creation and a brand new concept in League of Legends. Self-bonus defense skills are common among support champions. What’s not so common however, is the ability to boost an ally’s defense rates. Braum will be able to perform both tasks at once and based on his total armor and magic resistance. Which means, the higher those two ratings are the more bonuses this skill will grant. What’s left to know is for how long the effects will last. I don’t believe it will be long, in fact it should last only a few seconds, five maximum, else it would be immensely strong and unbalanced. Braum raises his shield in a target direction, negating the damage from the first attack from the shield’s direction and reducing the damage of all subsequent attacks as long as the shield is raised. Braum intercepts projectiles with Unbreakable, causing them to hit him and then be destroyed. He also gains a minor speed boost until he lowers his shield. This ability is similar to Yasuo’s Wind Wall, which absorbs enemy fire. In this case, Braum creates a frozen barrier that negates the first enemy attack and reduces the incoming damage from all subsequent attacks. Unbreakable can be extremely useful during the lane phase, mostly because it can easily deny the harasses from the enemy champions, whether support or ADC. Fast reflexes and prediction will create very interesting moves. For example, casting this ability before an enemy skill reaches you will automatically deny that skill’s damage. Braum will also gain a minor speed boost, which can be used for a consecutive engage if the moment is indeed advantageous. Braum slams his shield into the ground, sending out a huge long-range skillshot that knocks up and damages all enemies caught before leaving behind a strong slow field. 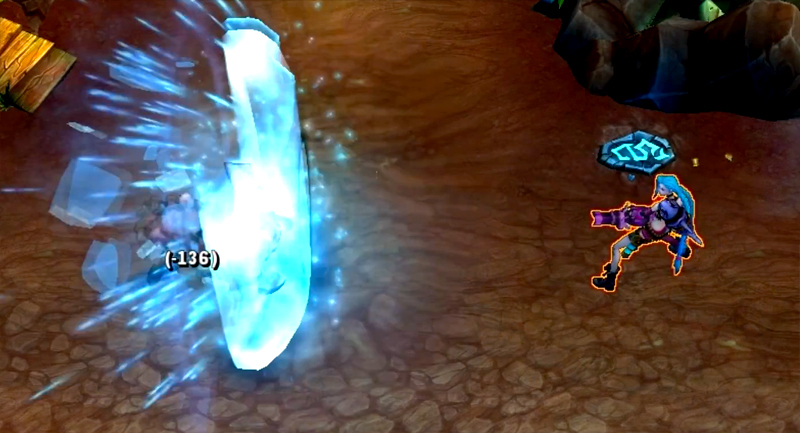 Braum’s ultimate is a massive frozen fissure that will disable enemies in a line. As obvious, this ability must be used with accuracy and precision in order to hit the most enemies possible. This way it won’t just knock them up for a short time, it will also reduce their movement speed, creating the perfect scenario for a team engage or disengage. Glacial Fissure can be combined with many other disable abilities, like Malphite’s Unstoppable Force and Yasuo’s Last Breath. The combo ultimates will extend the disability effect by restraining the enemy team from using attacks and abilities and it will simultaneously inflict huge amounts of damage. In the end, it’s always about timing and strategy. It seems pretty obvious to me that Braum will be the new Leona of the League. He will be the legend of supportive tanks with his multiple disables, damage absorption and defense boost skills. He will also be the terror of AD carries and he’ll be a hell of a challenge to kill. With his super-tank abilities, I don’t think it will be difficult to harass an enemy ADC and jeopardize his farming plans. In fact, a simple poke might end up in an spontaneous engage and possible kill. I can perfectly foresee a new perma ban option coming to the ranked system. Braum you won’t be forgotten.